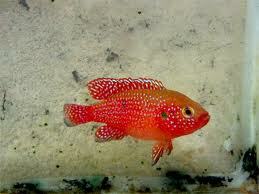 Jewelfish is a beautiful-looking, bellicose and hardy cichlid aquarium fish that can grow up to 6 inches long. There are many different species of the jewelfish with each having the same conditions and behaving the same. They are mostly found in the rivers of West Africa and spread to the Middle East and also to some parts of South America. The jewelfish is not a community fish. This means that it cannot live with another fish in a single tank. Its non-communal nature is characterized by aggressive attitude, especially when they are trying to protect their fry and mate. And again, the fact that it preys on other fish makes them unsuitable to be kept with other fish. However, its beauty and behavior make it worthwhile to consider breeding provided it is kept in its own tank. The upper part of the jewelfish’s body appears light olive-green shade while its lower body is dark-orange shade. Its lips, cheeks and the lower jaw are bright red. They also feature two black spots on their fill cover, one being located at the joining area of the tail fin, while the other around the mid-section. It is because of this beautiful appearance that makes many people to have the desire to keep them as pets. Jewelfish also feed on crustaceans, insects, and Caridina (shrimps and prawns). They can also eat some plants, such as weeds, algae and debris. When held captive, the fish can live on a varied diet including commercial frozen or live flakes and pellets. Any form of fish food is good for them. But they are also known to feed on their young practicing filial cannibalism. Despite the fact that the jewelfish are very hardy, they might occasionally get freshwater fish disease. So if you own some, you need to constantly acclimate them to a quarantine tank where you can keep watch over them prior to putting them in a display tank.